As far as the Avro Lancaster goes, the only kit in town is the Tamiya 1/48 Lancaster kit in its various guises. This kit has been issued in various formats over the years and up until recently, only one has been available with second hand examples fetching ridiculous sums on various auction sites. This all changed in early 2009 with the the release of kit number 61105 Avro Lancaster B Mk.I/III. As with all things, this kit has now been discontinued and replaced with a similar but more expensive boxing which now includes pre-painted canopies, this is kit number 61112. The great thing about these later releases is that they included a number of new parts that were only previously available as resin sets from Paragon Designs. 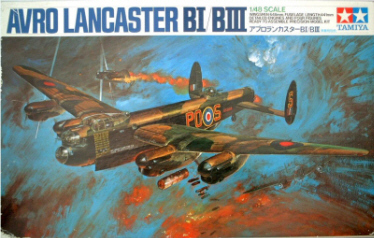 The first kit from Tamiya, and by far the most desirable was kit number MA120 (later re-numbered as 61020) 1/48 Avro Lancaster B Mk.I/III. This was a kit of the "standard" Lancaster bomber. 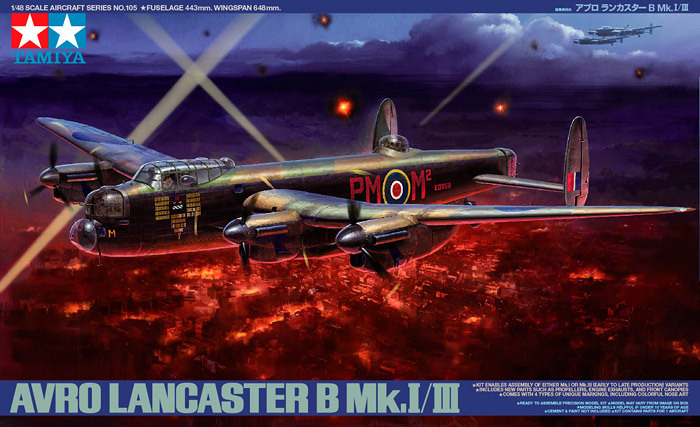 The second kit was number MA121 (later re-numbered as 61021) 1/48 Avro Lancaster Dambuster/Grand Slam Bomber. This kit could be built as either a Dambuster version or the Grand Slam version but could not be built as the "standard" bomber. 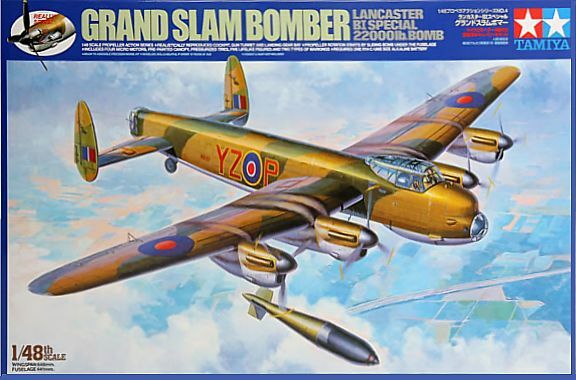 This has recently been re-released with some changes and is now available as 61111 Tamiya 1/48 Avro Lancaster Dambuster/Grand Slam Bomber. Version three, which has recently been discontinued, is kit number 61504 Tamiya 1/48 Avro Lancaster Grand Slam Bomber with propellor action. This is a revised version of kit number 61021 but without the required parts needed to build the Dambuster version. Other differences include the addition of four small motors to spin the propellors, pre-painted cockpit and turret transparencies and bulged tyres. Unfortunately, straight from the box, this kit cannot be built as any other version except the Grand Slam bomber. This kit is the pick of the bunch. It's many additions include the larger bomb aimer's blister, smooth bulged tyres, new engine nacelles with unshrouded exhausts, needle-blade propellors and a new twin 0.5" Browning rear turret. 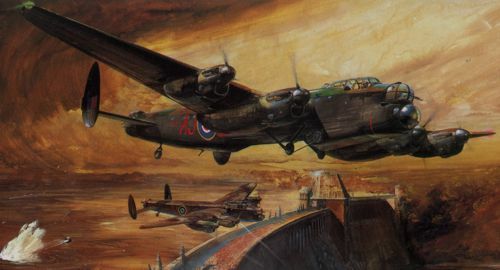 Paragon Designs were one of the first companies to offer some superb resin conversions for the Tamiya Lancaster but they have recently stopped trading. 48092 Lancaster B Mk.I/III RAF 100 Group Conversion. Originally the only source of the deeper-bomb aimers blister this kit includes resin, photo-etch and vac-form parts. 48120 Lancaster B Mk.II Conversion kit. Adds Bristol Hercules engines to build the Lancaster B Mk.II. 48121 Lancaster Narrow-Blade Propellors. As fitted to most wartime Lancasters before the introduction of the paddle-blade propellors. 48122 Lancaster Unshrouded Exhausts. Although some are provided in the kit, there aren't enough to do all 4 engines. 48123 Lancaster Tallboy Conversion. Comprehensive conversion kit which builds the Tallboy-carrying Lancaster. Includes the deeper bomb-aimers blister. 48125 Lancaster B Mk.I/III Bulged Bomb Bay Doors. Includes the ventral turret installation. 48126 Lancaster B Mk.II Bulged Bomb Bay Doors. For 8000lb bomb which also includes the ventral turret installation. 48129 Lancaster Bulged Wheels (Treaded). 48149 Lancaster Bulged Wheels (Smooth). 48150 Lancaster Deeper Bomb-Aimers Blister. A required addition. Other conversion kits were also offered by Paragon Designs, these included the Lancaster Prototype Conversion, the Avro Manchester conversion, Merlin 85 Nacelles and Lancaster Flaps. There are conversion kits still available to convert the Tamiya Lancaster to the Avro Lincoln but these are beyond the scope of this article.